Dr. Joseph Davis discusses how to choose a doctor for different stages of your reproductive health journey. A good relationship with your doctor makes all the difference for your health. When you have doctors you like and trust, you’re more likely to seek their guidance, confide in them, and follow their advice. The strength of your relationship with your care provider is even more important when it comes to your reproductive health, which can be highly personal and emotionally charged. 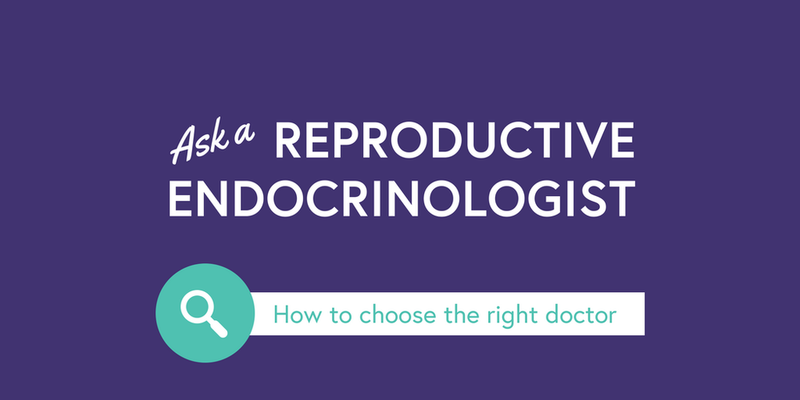 For this edition of Ask an Reproductive Endocrinologist, we asked Dr. Joseph Davis of Reproductive Medicine Associates (RMA) of New York to share his recommendations for finding the best providers for all stages of your reproductive health. Celmatix: When should a woman go to an OB-GYN vs. a reproductive endocrinologist (RE)? Dr. Davis: Most women will start seeing an OB-GYN at some point during their teenage years, and eventually an OB-GYN may act as a primary healthcare provider. As such, your OB-GYN is likely to know the most about your overall health, history, and lifestyle, so when you want to start a conversation about your fertility, you should start with them. However, all doctors have different specialties and interest areas. For OB-GYNs, this may or may not include fertility. When you discuss fertility with your OB-GYN, try to figure out where their specialty lies, as this may influence the guidance they give you. For example, if your OB-GYN is not particularly focused on fertility, they may not advise you to be as proactive as an RE would. If you don’t get the level of guidance or insight you want from that initial conversation with your OB-GYN, consider finding an RE. An RE can give you more comprehensive and in-depth information about fertility preservation or treatment options, particularly if you are beyond the initial information-gathering stage. Celmatix: How do you recommend women find their doctors? Dr. Davis: I always recommend first seeking a referral from your current doctors. Ideally, they know your preferences and needs, and can give you more personal recommendations. If you’re looking for an RE, start by asking your OB-GYN. Particularly if your OB-GYN is interested in fertility, he or she probably know REs in your town or area, and may have even worked with them. Online sources have also become popular research tools. I recommend using more focused resources — e.g., a fertility blog if you’re looking for an RE — before turning to more general review sites, like ZocDoc or Yelp. While those sites can be helpful, often they are very general and you don’t get a lot of context about why someone got a positive or negative review. Always try to get a comprehensive picture of the provider. Particularly if you find a name through online sources, try to verify that recommendation with another source — ask around your networks, or bring the recommendation back to your current doctor. Coworkers can also provide good recommendations, as they are likely to go to doctors who accept your insurance. But, regardless of what methods you use to find recommendations, make sure you use your first appointment as research as well. If you don’t have a good experience with the doctor — or the practice in general — try somewhere else. Celmatix: What information should we look for when researching? Dr. Davis: When you look for any new doctor, it’s important to ask yourself what you want to achieve. If you’re seeking an RE, is it because want to take a more aggressive approach after you’ve already tried to conceive for a while? Or are you just looking for more information, even though you’re not yet ready to get pregnant? Answers to questions like these can help guide you to the doctor you should see, particularly if you share them with your existing doctor when asking for a referral. Also, think about whether you prefer a more holistic or traditional Western philosophy regarding fertility. Some doctors take a completely holistic & natural approach and believe in self-driven lifestyle modifications over medication. Doctors on the opposite end of the spectrum don’t consider lifestyle factors at all. Many doctors fall somewhere in between — they’re not opposed to medication, but will consider how your lifestyle and overall health may impact that medication’s effectiveness in a comprehensive way. This is a spectrum, so think about where you’d like your doctor fall. Also, note that your preferences may change over time. Celmatix: If you have a doctor who isn’t meeting your needs, how do you know when it’s time to find someone new? Dr. Davis: The most important factor for your relationship with your doctor — at any stage — is your comfort. If you’re early in your fertility journey, or just looking for information, being comfortable will help you be transparent about your goals and proactively seek information. If you don’t feel your doctor understands your goals or your motivations, you won’t be so open, and you should look for someone else. During fertility treatments, you may feel the urge to change doctors if you don’t see results quickly. However, just because you haven’t gotten pregnant yet doesn’t mean your doctor is doing the wrong things. In all stages of fertility, treatment has the greatest impact when you just keep trying, which can require patience and perseverance. If you like and feel comfortable with your doctor, you don’t necessarily need to make a change just because you’re not yet pregnant. Ultimately, your comfort will lead you to get the best care. When it comes to fertility health in particular, you may feel frustrated or disappointed at times. Frustration with results is very different from the frustration that comes with feeling like you aren’t being heard by your doctor or aren’t getting good service from the practice overall. If either of those things are happening, don’t be afraid to look elsewhere.